My baby dove was outside in a cage. I put him on the top of the cage to feed him and out of the corner of my eye I saw a darting movement. I grabbed baby as a kookaburra brushed by my hand missing his “lunch” by an inch. 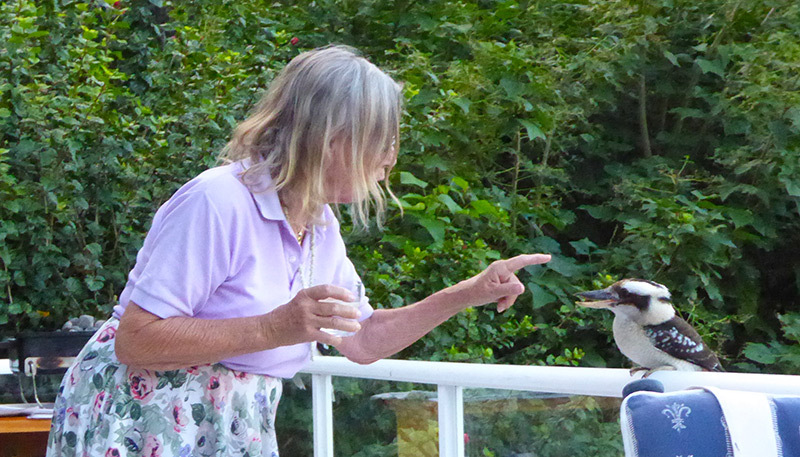 My next encounter with the same kookaburra was not so fortunate. Two days later I put my juvenile kookaburra on top of the adjoining cage for a quick meal of mouse cutlets. I had my hand on top of his head while holding his beak open. There was a mighty whoosh as the same wild kookaburra dived down to attack him, missing his target and hitting an artery in my hand. With blood squirting out like a fountain from one hand and young kooka in the other I rushed indoors shouting for help from my husband. We stemmed the flow of blood and put the bird back in his cage. With a pressure pad on the injury, and after cleaning blood from the floor, walls and clothes, I sat for the rest of the day with my hand in the air. That evening I went to the local medical centre and was given a tetanus injection in each arm with an appointment for two more to follow. Plus an expensive prescription for antibiotics. I know now not to feed baby birds outdoors and to keep up-to-date with my tetanus shots.